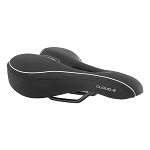 Home > Bicycle Seats - Help & "How To"
Bicycle Seats - Help & "How To"
Get Help with Bicycle Seats - Information and How-To Videos. Live help at (855) 855-1976 Talk to Customer Service - and visit our bicycle seat blog too! Official site featuring a complete bike catalog, online accessories store, training and maintenance tips, cycling team information, and dealer directory. Use their Fit Calculator to play with different set ups on their Semi-Custom bikes: Isis Pro/Sport, Valkyrie Tour and Fast Woman. Watch their design videos to learn the lingo and decipher the shop talk about bicycle frame design. Can You Identify the Bicycle Seat Below?